Japan's Ministry of Communications and Transportation established 13 Pilot Training Schools before the end of World War II. The Army ran ten Pilot Training Schools (year established in parentheses and prefecture where school was located in brackets) in Sendai (1938) [Miyagi Prefecture], Yonago (1938) [Tottori Prefecture], Niigata (1941) [Niigata Prefecture], Kumamoto (1941) [Kumamoto Prefecture], Inba (1941) [Chiba Prefecture], Kyoto (1942) [Kyoto Prefecture], Okayama (1942) [Okayama Prefecture], Miyakonojō (1942) [Miyazaki Prefecture], Koga (1942) [Ibaraki Prefecture], and Chikugo (1944) [Fukuoka Prefecture]. From the 13 Pilot Training Schools, there were 3,200 men who graduated, received supplemental flight training at Army and Navy training bases, and became noncommissioned officers. As Japan's situation worsened toward the end of the war, 162 graduates from Pilot Training Schools died in special (suicide) attacks. On April 19, 1942, a Ministry of Communications and Transportation Pilot Training School was established with the objective of training civilian aircraft personnel. For over two and half years, young men who yearned for the skies underwent rigorous training day and night at this place and flew from the nest here when finished. Some men died in battle for their country in World War II. With prayers for eternal peace and prosperity, we erect a monument here as testimony of our youths along with consolation for the spirits of the war dead and others who are deceased. (Normal Course Trainees, 2nd Class) 60 men started April 1942. In April 1943, 10 transferred to Niigata, and 21 transferred from Okayama. In March 1944, 70 transferred to Yonago. (Normal Course Trainees, 4th Class) 60 started April 1942. 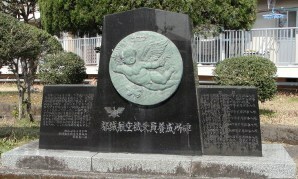 In September 1944, transferred to Chikugo. (Normal Course Trainees, 5th Class) 70 started April 1943. In September 1944, transferred to Chikugo. (Normal Course Trainees, 6th Class) 59 started April 1944. In September 1944, transferred to Chikugo. (Pilot Trainees, 12th Class) 60 started September 1942. 54 graduated August 1943. (Pilot Trainees, 13th Class) 60 started April 1943. 61 graduated March 1944. (Pilot Trainees, 14th Class) 80 started October 1943. In April 1944, 80 transferred from Kyoto and 80 transferred from Kumamoto. 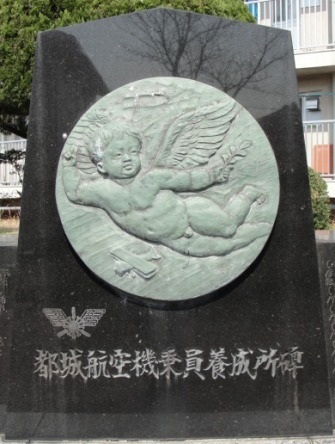 At same time, became Tachiarai Army Flight School Miyakonojō Training Unit. 240 graduated July 1944. (Normal Course Trainees, 2nd Class) Graduated September 1944 at Yonago. At same time started at Matsudo Advanced Pilot Training School Koga Branch School. Graduated June 1945. Deployed as Army Reserve Cadets in army air transport units. (Normal Course Trainees, 4th Class) In April 1945, transferred to Yonago. In August 1945 at war's end, graduated early. (Pilot Trainees, 12th Class) After graduation were deployed in civil aviation and as Army Reserve Cadets in training units at domestic and foreign locations. (Pilot Trainees, 13th Class) After graduation were deployed in civil aviation and as Army Reserve Cadets in training units at domestic and foreign locations. (Pilot Trainees, 14th Class) After graduation were deployed as Army Reserve Cadets in training units at domestic and foreign locations. The available published records do not indicate the number of special attack pilots who trained at Miyakonojō Pilot Training School as pilot trainees. No pilots who trained in the 2nd, 4th, 5th, and 6th Classes of Normal Course Trainees died in a special attack. Tokuta, Tadanari. 2008. Jōin yōseisho sotsugyōsei no tokkō (Special attacks of crewmen who were Training School graduates). <http://www.aero.or.jp/web-koku-to-bunka/2008.09.15youseijo21.htm> (June 14, 2017).